Dangal trailer is all here and all the fans of Mr. Perfectionist must be waiting for the analysis of the trailer so that many hidden secrets could be revealed. Here is the detailed analysis of Dangal Trailer by our team. We found two hidden scenes in the trailer which were screened only for a lapse of second. Aamir Khan was enough wise to skip these scenes only in a lapse of second so that the plot would not get revealed. But somehow after repetitive attempts and watching the trailer again and again we found some irregularities. For an instance one can get confuse in this scene. Actually in this scene, Aamir’s girl is dancing with a chunni on her head. Her younger daughter even gone to the next level and dancing like a boy. Not happy watching them getting too much inclined towards dance he slapped one of them and reveals that he wouldn’t tolerate anything which can disturb ‘their’ attention. Theory 2: There is another probability that the person in chunni is actually a boy because his appearance looks like that. If it’s true, then the boy must be going in relationship with one of his daughter. That would actually great – A love story too ? Aamir thrashed his eldest daughter in the akhada for failing him. Definitely, Dangal is not like Sultan where a local wrestler starts fighting in world championship the next day. In this story, Aamir is actually a well trained wrestler known for winning number of medals for his country. This could be the most difficult scene in entire Dangal trailer, but the actors had performed it very well. A lot of people loves to read mistakes of opponent of their favourite superstar. When everyone was coming after celebration, the juice hawker had his all the utensils clean like anything. He had not even prepared juice for once and it looks like completely non realistic thing. However, we agree that its very minor mistake and should be ignored. Well the Dangal movie trailer is more than perfect and you can guess it from right here. The other only mistake identified was a co actor looking at camera instead of the stars walking in front of him. 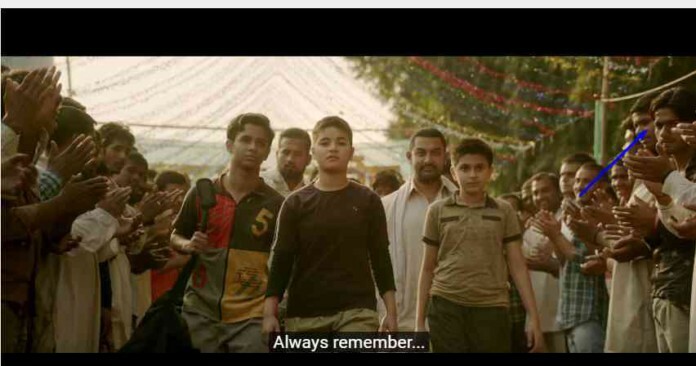 Dangal official trailer was perfect and hadn’t been unnecessarly dragged too much. Kudos to the team for making such awesome entertainer.